An advanced and comprehensive backup service for websites and databases, Dropmysite ensures that your information is always safe and secure, and can be easily recovered. It provides automatic cloud-based off-site backups of your websites and databases and lets you restore data in a single click. Additional features include website uptime monitoring and blacklist monitoring, ensuring you are notified instantly to any server outages or malware issues. LuxCloud offers a one-stop shop for white label cloud business applications. Get a 20% discount on the Suggested Retail Prices and start to resell cloud services today! Schedule automatic backups, choosing the frequency and time of day that works best for you. Stay covered in the case of server outages or other unexpected events with reliable off-site backups of your websites and databases. Self-service management panel for each solution makes it easy to schedule automatic backups and do one-click restoration. Dropmysite uses AES-256 military grade encryption to ensure your data is safe and secure. 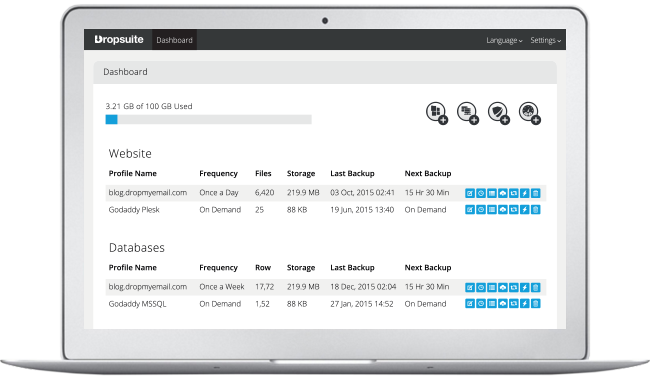 Choose from up to 30 backup versions, and restore your whole site or just a single file. Monitor your website uptime and performance and get instant alerts on any issues with malware or phishing to protect your site from blacklisting. Learn more about the benefits, features and technical specifications of Dropmysite. Download Dropmysite terms and conditions (coming soon). For general Frequently Asked Questions about LuxCloud and our services, please click here. Start your Free LuxCloud Trial. No obligation, no credit card required.